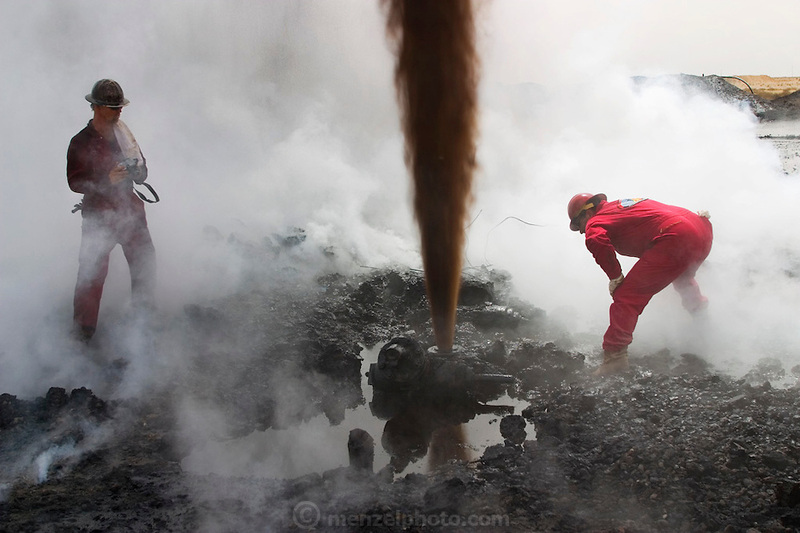 Boots and Coots team members study a gushing oil well minutes after the fire was extinguished. The ground is still smoking. Well capped two hours later using a "stinger," a tapered pipe on the end of a long steel boom controlled by a bulldozer. Drilling mud, under high pressure, is pumped through the stinger into the well, stopping the flow of oil and gas. The Rumaila field is one of Iraq's biggest oil fields with five billion barrels in reserve. Rumaila is also spelled Rumeilah.